The Tahiti Pro starts this weekend. Check it out at 'World Surf League'. Saturday's high tide is at 10.15am and Sunday's is at 10.45am. There is a 2.5 metre swell this weekend with slight onshore winds on Saturday but turning offshore around lunch on Sunday. The morning high tides meand there will be great waves for surfers of all levels from dawn until around 2pm. Advanced surfers may enjoy some world class waves on the outside bar on Sunday afternoon once the wind has fully turned. Tip: Adey's Place (by the Surf Club) will have hot chips and burgers ready to fill and warm you after your surf. 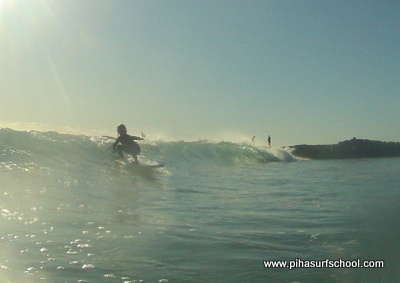 Here is a Six year old Piha Surf School student surfing Australia's famous Snapper Rocks last week. High tide on Saturday is at 10.15am and on Sunday at 11am. We have a 2 metre swell with light to moderate onshore winds forecast for this weekend. That means the best waves will be reforms by Lion Rock from dawn until 2pm. Tip:Use a slightly bigger board when surfing the reforms so you can perfect your jump up and foot placements in waves that give you more time for perfecting your technique. Australia's Owen Wright winning the lastest WSL event in Fiji. High tide on Saturday is at 12.15pm and on Sunday at 1pm. We have some offshore winds on Saturday and then the wind turning southwest on Sunday. Advanced surfers may prefer Saturday morning while beginner and intermediate surfers will have great surf on the inside reforms from 9am through until 3pm both days. Tip:This weekend we have the shortest day/longest night of the year. It means get your head warm after surfing and look forward to the days getting longer again next week. Winter Surf Lessons for Beginners. Auckland's moderate climate makes winter a great time to learn to surf. 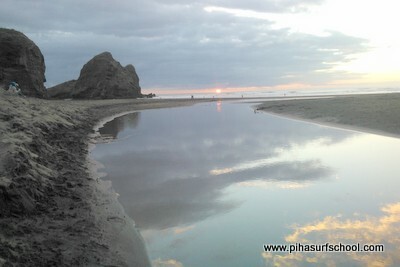 Piha is only 40 minutes from downtown Auckland and on the edge of national forest. Winter surf lessons can mean having no crowds on the beach or in the water and some fantastic rainbows and cloud formations in the sky. 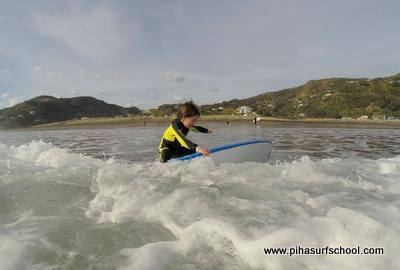 Piha Beach has a protected area for lessons that is free from rips or currents and perfect for beginners to learn to surf. Piha Surf School instructors have unique coaching techniques that will get you up and surfing to the beach faster. Piha Beach Surf Forecast - Saturday 13th / Sunday 14th June. Piha can video lessons using high definition cameras. The high tide on Saturday will be at 7am. On Sunday at 7.50m. We have a solid 2+ metre swell running past this weekend so the best waves will be in the reform between the Piha Surf Club and Lion Rock from dawn until 10am each morning and from 3.30pm until dark each afternoon. It will be a great weekend for practicing basic techniques and catching a large quantity of waves to practice on. Tip:With the shortest day of the year just a week away, hit the Piha Cafe for good food and a friendly place to warm up after your surf. Piha Surf School instructor enjoying waves at the World Surfing Champs in Nicaragua. High tides at Piha Beach this weekend will be at 12.15pm on Saturday and at 1.10pm on Sunday. The best time for beginner and intermediate surfers this weekend will be from 8.30am through until 3pm both days while advanced surfers will find some fun waves all day Saturday with the small 1-1.5m swell and light onshore winds. The wind will increase on Sunday but that will suit the lesser experienced surfers who will find great reform waves for practicing jump ups and feet positioning. Tip: Try trimming your balance hand on the wave as you ride to the beach to give you better control and body position. Winter sunsets after surfing are a higlight at this time of year. Saturday's high tide is at 7.25am. Sunday at 8.05am and on Monday at 8.45am. This long weekend has a fantastic forecast with offshore winds and a moderate swell running. This means there will be great waves for surfers of all levels. For beginners and intermediate surfers the best times will be from dawn until 10.30am each morning and from 4pm each afternoon. For advanced surfers there will be opportunities for world class waves on all tides. Tip:To stay warm in winter, run back up to your car from the water's edge as fast as you can so that your body warms from within before you get dressed. Filipe Toledo (Brazil) showing the move that won him the Rio de Janeiro Pro. 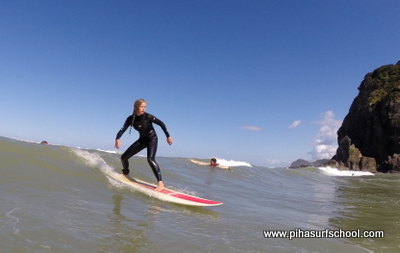 Tip: Ask your Piha Surf School instructor for some drills to help you improve faster. Leading Piha Surf School Instructor Is Off To World Surfing Champs. Zen after a training session at Raglan's Manu Bay. Zen Wallis has featured in New Zealand Surfing Teams for each of the last three years. The 2015 ISA World Surfing Games will be held in Nicaragua next month and Zen will be looking to do better than his 25th position he achieved last year. The event has over 20 countries sending their 6 person teams, (4 men, 2 women), to compete at the prestigious event that is in it's 51st year. While only 23 year's old, Zen's experience at these events will be invaluable to his fellow team members as they try to gain qualification into the China Cup in January next year. Some children learn to surf as soon as they can walk. We have great conditions forecast for this weekend with light winds and a solid 2 metre swell. This will mean some great waves for intermediate and advanced surfers in the Cove from dawn until 11am while beginners will find fun reforms again between the surf club and Lion Rock. Tip: For beginners in the reform waves, try jumping your front foot 10 cm further forward as soon as you have got to your feet so that you get a shot of speed to ensure you can ride your wave as far as possible. Piha Surf School instructors surfing at Piha this week. On Saturday we have high tide at 2.50pm and on Sunday at 3.55pm. There will be perfect offshore winds this weekend and a 1.5 to 2 metre swell running which will mean some excellent waves especially for advanced surfers. For beginner and intermediate surfers there will be fun reforms in front of the surf club each day from 11am through until 4pm. The water is still warm so make the most of these fantastic autumn conditions. Courtney Conlogue Wins At Margaret River. Highlights of the Drug Aware Margaret River Pro in Western Australia. 22 year old Californian surfer, Courtney Conlogue has beaten the world's best women to win the third event of the 2015 Women's World Title race. Up against 2015 ratings leader, Carissa Moore (Haw) in the final, Conlogue has shown that she has the consistency to threaten for this year's world title. The win has promoted Conlogue to number 2 in the world rankings with the fourth event to be held in Rio de Janeiro next month. 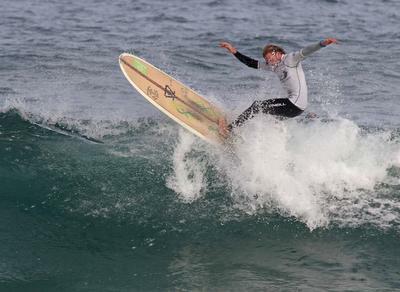 Piha Surf Instructor winning the South Island Champs Longboard Division last weekend. High tides: Saturday 11th - 9.10am, Sunday 12th - 10am. 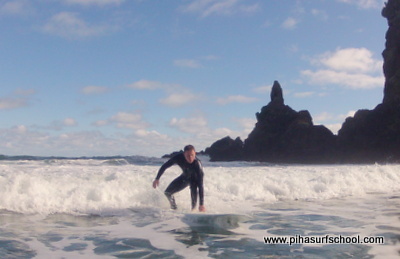 With great weather forecast, there will be fun waves for surfers of all abilities at Piha this weekend. The morning high tides mean that the best time for surfing will be from dawn until 1pm each day although advanced surfers may find some runners on the outside bar in the afternoon. Tip:Make sure you wax your board before each surf and you can draw a circle with wax where your front foot goes. Remember your front foot should land in the same place as your heart is when you are paddling. Ricardo Christie Beats World Ratings Leader. Ricardo Christie pulling in on a wave so hollow it is called 'The Box'. New Zealand's first surfer to contest the WSL World Title for over 13 years won his 2nd round heat at the Margaret River Pro in Western Australia today. The Margaret River Pro is the 3rd event on the WSL World Tour which will decide the 2015 World Champ. In the super heavy barrels at The Box, Ricardo found the quality waves to outscore current ratings leader, Filippe Toledo (Bra) today. The win has meant Ricardo will now face Adriano de Souza in the 3rd round. Piha Surf School instructors set 'high' standards. While the sand banks are not the greatest right now, the light winds forecast all weekend and morning tides will see great waves for all abilities from dawn until 1pm each day. For absolute beginners, stay between the Piha Surf Club and Lion Rock and if you have any doubts, contact a Piha Surf School instructor or lifeguard for advice. Tip:With shifting peaks, it is good to count your waves to maintain a focus and keep a mental record of which waves you caught were you best ones. 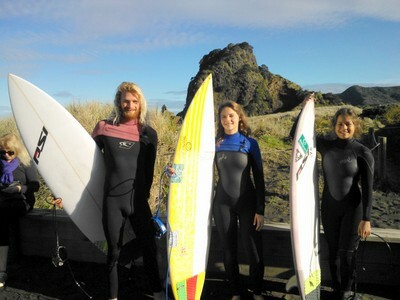 Piha Surf School instructors know the safest places to surf. High tide on Saturday is at 10.20am and on Sunday at 11am. We have great conditions forecast for this weekend with 1 - 1.5 metre waves and light offshore winds. The best time for beginner and intermediate surfers will be from dawn until 1pm both days while advanced surfers may find some world class banks at the surrounding beaches. Tip:With great waves there may be some crowded days so it is important to play it safe, and remember to communicate clearly when you are catching your wave so that other surfers know to pull back. First Event of the 2015 World Title Race is On. Snapper Rocks is one of the best surf spots in Australia. 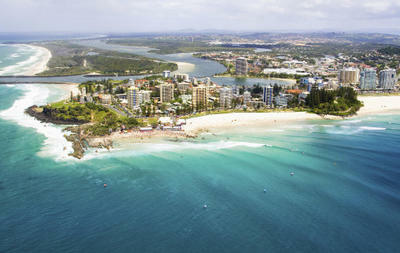 The Quiksilver and Roxy Pro surfing contests are being run simultaneously on Australia's Gold Coast right now. The Men's tour has 11 events while the Women have 9 contests with both titles being decided in Hawaii in December. Both tours have a number of young hot shot surfers who will be trying to make their name against the seasoned campaigners like Kelly Slater, (11 World Titles), who is the eldest at 42 years of age. Many are saying this will be the most exciting year of all. Google World Surfing League to find out more. Instructor Zen surfing a longboard during the 2015 NZ Surfing Champs. This Saturday's high tides are at 6.40am and at 7.20pm. On Sunday the high tides are at 7.50am and 8.20pm. Our golden summer continues. On both Saturday and Sunday we have very light winds and a 1 metre swell. The high tides will bring the best waves for all levels of surfing which means from dawn until 10am and from 4pm until dark will be the optimum times for surfing on both days. Tip: With small surf, exact foot positioning is really important. Speak to an instructor for some drills you can practice to perfect your stance. 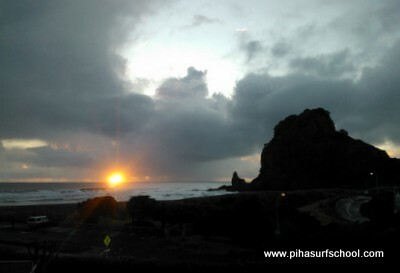 Many great sunsets and great waves for improving your surfing at Piha this weekend. High tide on Saturday is at 12.25pm and 1.10pm on Sunday. There is another great surf forecast for this weekend. We have 1-1.5m waves and light offshore winds. Beginner and intermediate surfers will find fun waves between 8.30am and 2.30pm while advanced surfers, will again, have fun waves on all tides, depending on which part of the beach they choose to surf. Tip: Speak to your Piha Surf School instructor for tips on which part of the beach will have the best waves for your ability. 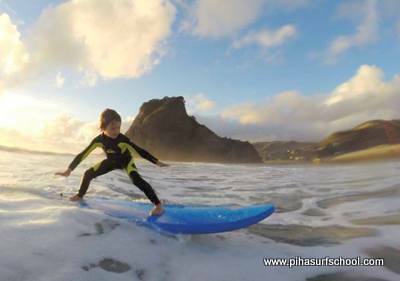 Great technique and good equipment helps Piha Surf School students have a higher success rate. Saturday's high tide is at 7.10pm and Sunday's high tides are at 7.40am and 8pm. We have an excellent forecast for this weekend with offshore winds and at 1-1.5m swell running. Best times for beginners and intermediate surfers will be from dawn until 10.30am each morning and from 4pm until dark each afternoon. 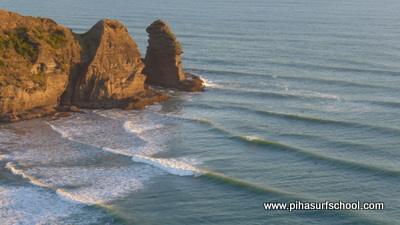 Advanced surfers will have great waves on all tides and may find some uncrowded breaks along North Piha Beach. Tip: Put some extra work into your jump up technique on dry land so that you improve your success rate in the water. A good jump up helps all other aspects of your ride. Advanced Surfers at Piha Beach, New Zealand.. This video features two of our instructors showing their local knowledge. Advanced surfers paddle through a long cave to get out to the bar at Piha. Piha Surf School instructors can guide you out through the 'keyhole' or show you how to use the rips safely to access the best waves. Please remember that using the 'Keyhole' and doing rock jumps are for advanced surfers or to do with an instructor. Surfing is about having fun and to have fun you need to be safe. If you are unsure of conditions or a situation, play it safe always. The best results always come from being cautious and staying within your limits. 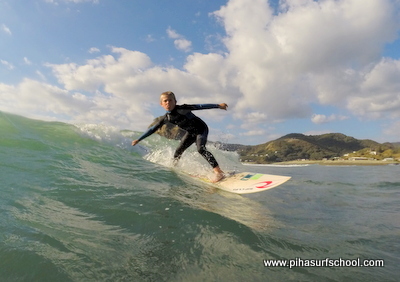 An eight year old surfer enjoying the fantastic conditions at Piha this week. High tides for this long weekend are: Saturday 1.25pm, Sunday 2.20pm and Monday 3.15pm. We have optimum conditions forecast for this weekend which will give great waves for beginners and intermediate surfers from 10am through until 5pm all three afternoons. For advanced surfers we have world class waves on the outside bar that should create great rides all day. Tip: Take a marker on the foreground at the beach and then a second marker in the background so that you are aware of where you are surfing at all times. If there is any sideways current taking you away from the best area that you can not outpaddle, return to the beach and walk back to where you want to surf. 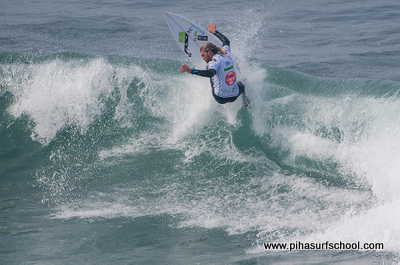 Billy Stairmand Wins 4th NZ Surfing Title at Piha. 17th January 2015. Raglan surfer, Billy Stairmand is the 2015 NZ Surfing Champ. The 2015 NZ Surfing Champs concluded today with Billy Stairmand (24yrs) winning the premiere, Open Men's division. Stairmand surfed incredibly throughout the event showing why he was on the verge of qualifying for the 2015 World Surfing League to compete against the world's best like Kelly Slater and Mick Fanning. Top Piha Surf School surfer, Tane Wallis finished in 4th place in the Open Men's division and 3rd in the Open Men's Longboard division. Surf Lessons for all abilities. 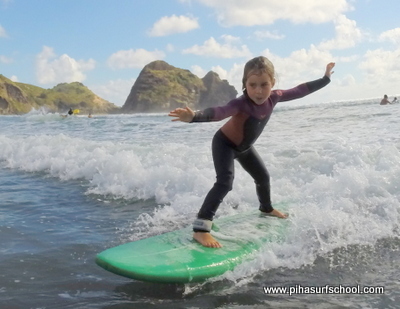 Piha Surf School can structure lessons around the student's ability using years of experience with the local conditions. Learning to surf can be one of the most natural and exhilerating activities. 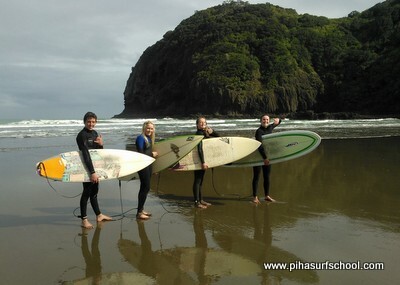 When you book a lesson at Piha Surf School, your instuctor will quiz you on what experience you have and what you would like to get out of the lesson. Your instructor will then take you to the part of the beach that best suits your ability. Gabriel Medina Wins Title of 2014 Men's World Surfing Champ. Gabriel Medina set up his World Title with wins in key events in Australia and Fiji. Brazil's Gabriel Medina placed 2nd at the Pipeline Masters contest in Hawaii after both Kelly Slater and Mick Fanning were eliminated in the early rounds. At 20 years old, Medina is first Brazilian and 2nd youngest surfer to win the World Title. Going into the final event, only Slater (USA), and Fanning (Aust), could beat Medina for the title but both needed the young Brazilian to falter early while they needed to go on and win the event. In the powerful hollow waves, Gabriel Medina was only outdone by Julian Wilson (Aust) who won in a close fought final where both surfers scored over 19 points from the possible 20. Australian surfer, Stephanie Gilmour, winning her 6th World Title in Hawaii. On Saturday 20th December high tide is at 9.20am and on Sunday 21st at 10.20am. We have a small 1 metre swell with light winds which should mean fun waves for surfers of all abilities. The best time for beginners will be from dawn through until 1pm each day although the slight swell will mean safe conditions all day. Tips:When looking for a present someone will really appreciate, a Piha Surf School gift voucher will help the receiver feel great about themselves and you. Surfing is a healthy and inspiring activity that makes a person feel special for days after. France's Pauline Ado surfing at the Maui Pro in Hawaii. High tide this Saturday is at 4.10pm and on Sunday at 5.20pm. With more onshore winds forecast for this weekend, the best times to surf will be from 1.30pm through until dark on both days. There will be a reform in front of the Piha Surf Club that will have some fun waves especially for intermediate and beginner surfers. Tip: Your Piha Surf School instructor can give you some disciplines to practice that will improve your overall surfing ability where it matters. Surf Forecast for Piha Beach. High Tides: Sat. Nov 8th - 11.20am. Sun 9th - 12.40pm. One on one lessons with a 6 year old boy brings results. We have a reduced 1-1.5m swell running this weekend which should give some great waves for all abilities, especially on Sunday when the wind turns to be light offshores. With lunchtime high tides, beginner surfers will have fun waves to train on from 8am through until 4pm both days. Advanced surfers have the chance for some world class breaks at North Piha and Karekare on Sunday. Tips:Do not try to stand up on your board until you feel yourself being propelled with the wave. As soon as you feel yourself moving, you can push your chest up and hold for 3 seconds before you jump. This will give you more stability as you transition from paddling to getting up. Piha Beach Surf Forecast For This Weekend. (Nov 1st and 2nd). 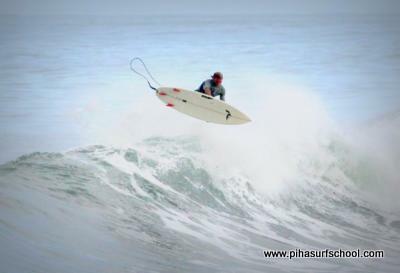 One of two Piha Surf School instructors competing at the World Champs in Peru. With onshore winds being predominant at this time of the year, the best opportunities for surf at Piha are around the high tides in the reform waves. For beginners the best time will be from dawn until 9.30am and from 2.30pm through until dark on both days. Tips: Use a board slightly bigger than normal or try a longboard to work on technical aspects of your surfing. Check with a Piha Surf School instructor about drills you can try to improve faster. Labour Weekend Surf Forecast for Piha Beach. Waves rolling in on to the Piha Bar. High tides: Saturday 11.20am. Sunday 11.55am. Monday 12.40pm. There will be a 1.5 - 2 metre swell running all three days. The southerlie wind on Saturday morning will give the best conditions for advanced surfers while beginner and intermediate surfers should find some fun reforms between 8am and 2pm each day. Tips: For beginners not familiar with Piha Beach, the safest place to surf will be in front of the Piha Surf Club. Please be aware of your positioning at all times and return to the beach and begin again if you drift too far down the beach. Piha Beach Surf Forecast - 18th and 19th October. 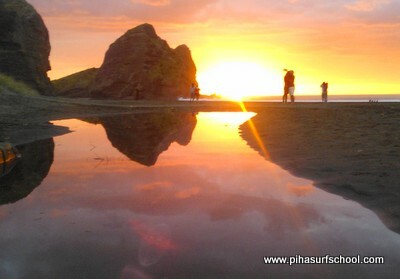 Piha is known for it's fantastic sunsets. High tides this Saturday are at 6.30am and 7pm. On Sunday it's high at 7.25am and 8pm. There will be offshore winds both mornings with light onshores from 10am onwards. The best time for advanced surfers will be from dawn through until mid morning while beginner and intermediate surfers will enjoy great reforms from dawn until 9am and from 4pm until dark both days. Tip: If you are unsure, contact a Piha Surf School instructor for advice on where to find the best reforms that are free from rips or currents..
Surf Forecast - 11th and 12th October. Spring is in the air for one Piha Surf School instructor. High tide on Saturday is at 12.20pm and on Sunday at 1pm. We have a deminishing 2m swell and light off to cross shore winds on Saturday and similar conditions for Sunday. The mid day high tides mean that there will be fun waves for surfers of all abilities. The best waves for advanced surfers will be on the outside bar first thing both mornings. Tip: Make sure you communicate with other surfers to let them know you are going for a wave or are on a wave. This will lessen the chance of anyone dropping in and spoiling your ride. Hawaiian John Florence wins Quiksilver France Pro. Here are the Quiksilver Pro highlights. Only two more contests left to decide the 2014 World Champion. With both Gabriel Medina (Bra) and Kelly Slater (USA) being eliminated in the quarter finals, 23 year old John John Florence continued with the form he showed in the fifth round when he beat 3 time World Champion, Mick Fanning, by posting a near perfect 19.90 points from 20. Florence easily beat Josh Kerr (Aust) in his semi and then Jadson Andre (Bra) in a very one sided final. Two podium finishes in as many contests has lifted Florence to 5th on the ratings with Medina and Slater still sitting in the top two places with contests in Portugal and Hawaii still to go for the 2014 season. Instructor Off To World Champs. Zen, leading the way for his country in Panama in 2011. 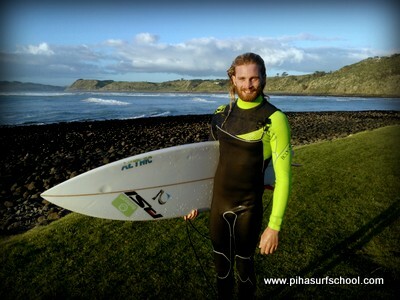 Piha Surf School's leading instructor, Zen Wallis, has been selected for the 2014 New Zealand Surf Team to compete in the 50th ISA World Surfing Games in Peru next month. This is the third time Zen (23 years) has been selected to represent his country, having gained a top 20 place last year at the ISA World Longboarding Champs. Zen is the current Auckland Surfing Champ and has surfed and competed internationally since the age of 13. For those wanting regular updates of his preparation and progress please like our Facebook page. Piha Beach - Weekend Surf Forecast - 4th and 5th October. Zen, Emma and Christina about to do a video training. Saturday's high tide is at dawn and 6.22pm and on Sunday at 7.50am and 8.20pm. With a strong swell running we are back in the reform waves after a nice run of surf last week. The best times to surf will be from dawn until 10am and from 3pm until dark both days. For beginners the best place will be right in front of the Piha Surf Lifesaving club while intermediate and advanced surfers will be able to train in the cove. Tip: Keep checking the surf club to stay aware of where you are. If you start drifting towards Lion Rock or down the beach, come in and re-enter the water in front of the surf club. Competition Heats Up At The Quiksilver Pro In France. Here are the Round 3 and 4 Highlights. With only two events left for 2014 after the France Pro, the World Title race heats up. Brazilian 20 year old surfer, Gabriel Medina, still leads the ratings from 11 time World Champ, Kelly Slater (USA). Medina has surfed straight into the quarter finals while Kelly and the other title contender, Mick Fanning (Aust) will have to surf in the 5th round in difficult conditions to even make the Quarters. If either of them fail to make their heats, Medina will have a commanding position going into the last two events of the year in Portugal and Hawaii. Piha Surfing Forecast For The Weekend. Contact us now for our holiday surfing program. High tide on Saturday 27th September is at 11.20am and on Sunday 27th at 12 noon. We have great surf forecast for Saturday with a 1.5m swell running and offshore northerlie winds. On Sunday the wind does go onshore but the lunch time high tide means there will be lots of fun at Piha Beach in the reforms from 9am until 2.30pm. Tip:Remember to move your time pieces an hour forward on Saturday evening to adjust for daylight saving. 'After work' surf sessions are finally here! Weekend Surf Forecast for Piha. Eleven times World Champ, Kelly Slater competing in Southern California this week. High tide on Saturday 20th is at 7.10am and on Sunday 21st at 8am. The best time to surf for all surfers this weekend will be from dawn until 10am both days and from 3.30pm to dark. We have onshore winds and a 2 metre swell running so the best waves will be reforms around the high tides. Reforms will be fantastic for those wanting to maintain their fitness and wash off the boredom of politics and the election this weekend. Tip:Ride a slightly bigger board than normal and put some work into sharpening your jump up technique. 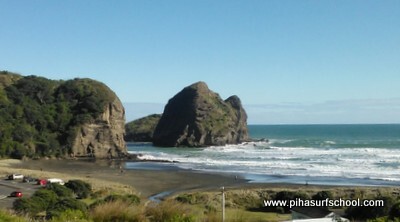 Piha Beach - Weekend Surf Forecast - 13th and 14th September. 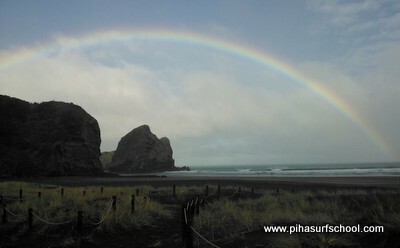 Great waves at Piha all week and the odd rainbow. High tide on Saturday (13th) is at 12.30pm and on Sunday at 1.15pm. We have offshore winds most of Saturday and an increasing 1.5m swell. This means great waves on the outside banks for advanced and intermediate surfers, while beginners will have fun on the inside reforms. On Sunday the wind turns to the south west quarter so not so good for advanced surfers, but from 9am to 3pm both days, beginner and intermediate surfers will have fun if they know where to go. Tip:Get in the habit of keeping one eye on the surf while you are getting your wetsuit and board ready. The more you see, the smarter you will be. Piha Beach - Surfing Forecast - 6th and 7th September. Teenagers venturing to one of Piha's not so well known surf spots. High tide on Saturday is at 7.15am and on Sunday at 8.10am. There is more great surf forecast for this weekend. With a 1.5 - 2 metre swell running and with favourable offshore winds, there will be be good waves in a number of locations. For Beginner and intermediate surfers, the best times to surf will be from dawn until 10am on Saturday and from dawn until 11am on Sunday. Both afternoons will be good from 4pm until dark. For advanced surfers, if they know where to look, they will have optimum surf on all tides. Tip:It's time to brush off the cobwebs and get some technique training so that you can make the most of this amazing start to Spring with good looking Summer conditions to follow. Piha Beach Surf Forecast for 2nd and 3rd August 2014. Waves like this can break at North Piha when the wind is northerly. High tide this Saturday is at 1.30pm and on Sunday at 2.30pm. On Saturday we have winds from the north and a strong 2 metre swell running. This means that very advanced surfers may find some waves on the outside bar around mid-day while beginner and intermediate surfers will have some reform fun from 10am on Saturday and 11am on Sunday. On Sunday the wind turns northwest and then southwest so the reforms will be best on Sunday. Tip:Piha Surf School instructors know the best part of the beach so that you can get really good waves, even when conditions are not the best. Surf Forecast For Piha Beach 26th and 27th July. This is the amazing set up at the south end of Piha Beach. Saturday's high tide is at 9.30am and on Sunday at 10am. The days are getting longer again and with morning high tides, the best time to surf will be from dawn to midday on both Saturday and Sunday. We have a deminishing 2 metre swell and the light winds on Saturday morning could bring some good waves for advanced surfers out on the outside bar. Beginners and intermediate surfers could find some fun waves in the cove between the Camel Rock and the Tasman Lookout. 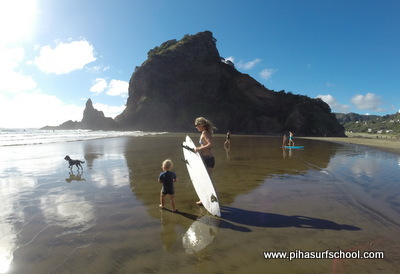 Tip:Speak to a Piha Surf School instructor to find out the safest and best place to surf at Piha Beach. 2013 World Champ, Mick Fanning, Wins In South Africa. Highlights from the Jeffreys Bay Pro in South Africa. Australian and 3 times World Champ, Mick Fanning, surfed impeccably through heat after heat to reign supreme in the best contest waves of 2014. Jeffreys Bay is a long point break giving the world's best surfers the chance to show their expertise in their individual quests to become this year's World Tour Champ. Mick Fanning's win has taken him up to 3rd in the World Title race after 6 events. Runner up, and fellow Australian, Joel Parkinson, sits in 2nd place, while Brazilian wonder kid, 20 year old, Gabriel Medina holds on to the top spot. Piha Beach Surf Forecast 19th and 20th July. Connor from Canada perfecting his technique on a Piha reform wave. High tide this Saturday is at 3pm and on Sunday at 4.15pm. Saturday we have perfect conditions that should give advanced surfers epic waves on the outside bar and up at North Piha. For beginner and intermediate surfers, there will be good waves in the inside reforms from 11am to dark each day. On Sunday the surf will be best for advanced surfers first thing in the morning. Tip:We are in the coldest part of the year so a quick warm up before your surf is advised and then a sprint up the beach after your surf will help you stay warm while you are getting changed. Piha Beach Surf Forecast For This Weekend. 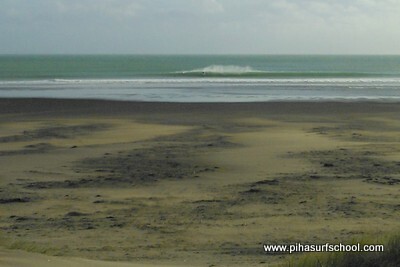 North Piha was deserted today but with some perfect waves for the dedicated. High tide on Saturday 12th July is at 9.50am and on Sunday 13th July at 10.35am. The waves on both days will be around 2 metres high with light north west winds on Saturday and light south west winds on Sunday. The morning high tides will give great reforms for beginner and intermediate surfers between dawn and 12 noon each day, while Sunday could have some really fun waves on the outside bar for advanced surfers and adventurous intermediate surfers. Tip:Ride a slightly longer board when training in reform waves so that you can perfect your jump up technique and foot positioning. World's Best Surfers Are Ready To Go In South Africa. The 6th event on the World Championship Tour is about to start. Check out the build up. With 20 year old Brazilian surfer, Gabriel Medina, leading the WCT ratings after the first 5 events for 2014, there is talk of this being the beginning of a new era.Tahiti's Michel Bourez sits in 2nd place and 11 times World Champ, Kelly Slater, is in 3rd. Jefferies Bay in South Africa is a long peeling right hander that requires a great degree of technical skill to pick the right waves and surf well. This contest will be the make or break event for many surfers and will give the world a good look at who will reign supreme this year. Check our facebook page for the link to the live webcast. Tia (5 years old) loves winter and uncrowded waves. High tides this weekend are at 10.30am on Saturday and 11.am on Sunday. With a good swell running, the waves will suit beginner and intermediate surfers who can train on the inside reforms between the surf club and Lion Rock from dawn to 2pm each day. Advanced surfers may find some fun uncrowded waves on the outside bar Sunday morning due to the light winds forecast. Tip:Use these winter days to train and perfect your technique on the inside reforms so that you are fit and ready to go for when we get optimum conditions. All product names of services mentioned are trademarks or registered trademarks of their respective owners.